PersianDNA™ [TRAVEL] Where do you want to Go? 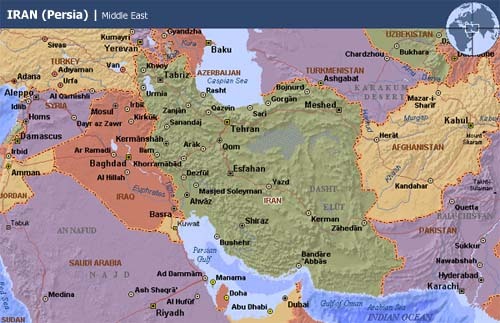 Neighbors: Iran is bordered on the north by Armenia, Azerbaijan, the Caspian Sea, and Turkmenistan; on the east by Afghanistan and Pakistan; on the south by the Gulf of Oman, the Strait of Hormuz, and the Persian Gulf; and on the west by Iraq and Turkey. Iran is dominated by a central plateau, which is about 1,220 meters (4,003 feet) high and is almost entirely surrounded by mountain chains. In the north, paralleling the southern shore of the Caspian Sea, are the Elburz Mountains. The highest peak in Iran, Mount Damavand (5,670 meters/18,602 feet), is part of this mountain system. Along the western border, the complex Zagros Mountains extend southeast to the region bordering on the Persian Gulf. Mountains of lower elevation lie to the east of the central plateau. Except for the relatively fertile plateaux of the northern Iranian provinces of Azerbaijan, mountain soils are thin, heavily eroded, and infertile. The narrow Caspian coastal plain, in contrast, is covered with rich brown forest soil. The only other generally flat area is the plain of Jolgeh-ye Khuzestan in the west. Two great deserts extend over much of central Iran: the Dasht-e Lut is covered largely with sand and rocks, and the Dasht-e Kavir is covered mainly with salt. Both deserts are inhospitable and virtually uninhabited. In the winter and spring, small streams flow into the Kavir Desert, creating little lakes and swamps. In other times of the year, both deserts are extremely arid. Iran is divided climatically into three main regions: the extremely hot coast along the Persian Gulf and the Gulf of Oman; the temperate but arid central highland; and the tableland of the intensely cold Elburz Mountains. The annual average precipitation for the country is about 305 millimeters (12 inches). The desert regions receive only about 125 millimeters (5 inches) per year, however, and the plain along the Caspian Sea gets about 1,270 millimeters (50 inches). Iran’s oil-dominated economy is able to provide good levels of basic services such as sanitation and safe water, but pressure has increased on water quality, forests, and other resources. Water pollution from oil spills and the Gulf War (1991) is a particular problem in the Persian Gulf. Air pollution is caused by refinery operations, vehicle emissions, and industrial effluents. National parks cover almost 5 per cent of the country to protect quite significant biodiversity resources. © 1988-1998 Microsoft and/or its suppliers. All Rights Reserved.